The first routes used for overland travel were paths taken through the wild by Aborigines. The first recorded European overland expedition from Sydney to the Hunter Valley was in 1823 by a team led by Major Morrisett. 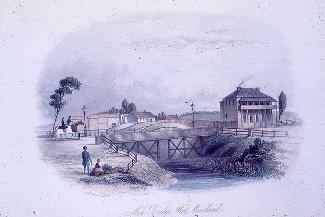 That same year, Sydney was connected to Maitland through the development of Howe's Track. At this point overland travel was very rough and took a long time, and travel by ship was preferred. Even after the Great Northern Road was finished, ships were still used to move passengers and export cargo. At this time roads were mainly used as stock routes. Roads did not become an effcient way of moving goods until improvements were made in the 1940's. Within towns, roads were developed at a faster pace. In Newcastle, the first road was Watt Street, which originated from a path used to carry coal to cargo ships. Illustration, 'New Bridge, West Maitland', artist unkown, c. 1830's, UoN Dr.John Turner collection. Horses and horse-drawn carriages were a popular mode for shorter distance travel within the Hunter Valley until the 1930's and many roads and bridges were built to accommodate these.After the 1940's private motorcycles and automobiles were common. Motocycles were a cheap way to get around. Once the roads and highways were established, some coal was transported by truck. This, however, failed as a viable option as fuel become more expensive and the roads became more crowded. Because of this, coal continued to be transported by rail.